Gwybodaeth i Rieni ynglyn â diogelwch arlein. Our children today are growing up in a very different world from the one we grew up in. Most children these days have regular access to the internet via PCs, games consoles and mobile technologies. Whilst this instant communication offers fantastic opportunities for learning it is our responsibility as adults to ensure we keep our children safe from any dangers or images that could upset them. At Whitchurch Primary School, we have a robust e-safety policy and Acceptable Use Agreements in place to protect pupils and staff. 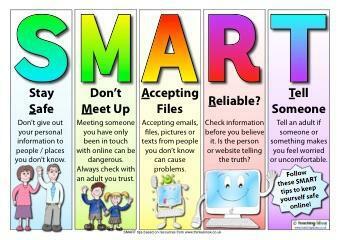 All pupils receive e-safety lessons as part of their curriculum. We have an annual visit from our School Liaison Officer from South Wales Police to talk about the issue of Cyber-bullying. Pupils receive assemblies dealing with the issue of e-safety. We aim is to provide regular presentations to parents about e-safety as well as support if requested. Please support us by talking to your child about e-safety issues and monitoring what they are doing online and while using technology. Click above to visit the NSPCC 'Be Share Aware' website. Welsh Government Parent/Carer’s Guide to Social Media A parent and carer's guide to social media: the risks and benefits of using social media networks and how to help children and young people use them in a positive way. Canllaw i rieni a gofalwyr ar gyfryngau cymdeithasol: rhai o’r risgiau a’r manteision o ddefnyddio rhwydweithiau cyfryngau cymdeithasol a sut i helpu plant a phobl ifanc i’w defnyddio mewn ffordd gadarnhaol. CEOP Click above to visit the CEOP website.